26 tracks, recorded between 1911 and 1927, spanning the entire career of this saxophone troupe that started the "saxophone craze" of the 1910s, and comprising roughly half of their recorded output. Beautiful 24-page, full-color booklet contains extensive notes by Brown Brothers expert Bruce Vermazen, and it includes uncommon illustrations from Vermazen's personal collection. Of special note is the inclusion of three previously unreleased tracks, particularly one in which leader Tom Brown performs his legendary "abandoned-bride" routine--a humorous interplay between a full orchestra and the consummate saxophonist showing his full bag of tricks. 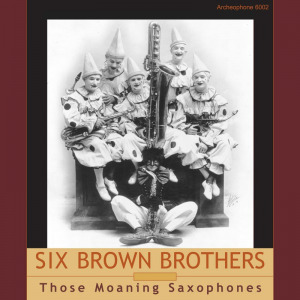 Visit Those Moaning Saxophones' expanded catalogue page to see the complete track listing, read an extended description, and listen to sound samples.